New LAMPlit: Why Do I Need to Understand Fair Use? Ever wanted to use someone else’s work to make something of your own? Maybe you’ve been inspired to sample a song to make your own music, wanted to include movie or TV clips in a video you’re making, or maybe you’re just looking for sound effects to round out a podcast. If this is the case, then you need to understand Fair Use. It’s a clause in copyright law which gives you the right in certain cases to legally and ethically use pieces of copyrighted material. 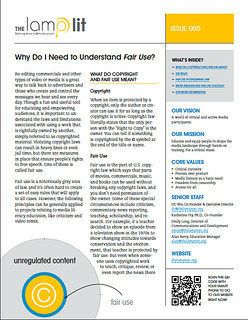 We’re making it easy to get the basics on Fair Use with the latest in our LAMPlit series, called Why Do I Need to Understand Fair Use?. Not only does it lay everything out for you in plain English, it’s even got a super handy checklist for you to use as you’re making your media masterpiece. Depending on what you’re doing, violating copyright law is kind of like committing plagiarism, which is not only extremely uncool, it’s also illegal. Fair Use can protect you and your work, but you have to follow the guidelines. Download our LAMPlit, and you’re one step closer to exercising your right to remix the media! ← The LAMP Announces the Transition of Co-Founder and Education Director Katherine G. Fry, Ph.D.